This wonderful book is 208 pages chock full of photos from all Godzilla movies 1954 to 1999. There are some incredible behind the scenes photos. Every single monster that appeared in a Godzilla movie is covered. There is a full page spread of photos of prop figures used in some of the Godzilla movies. There are drawings of the insides of Godzilla and some of his foes. Interviews (in Japanese) with most of the contributors (those still living) to the special effects and production teams on many of the movies. This is a GREAT Godzilla History Book! The condition of this book is MINT. PLEASE scroll down for photos. 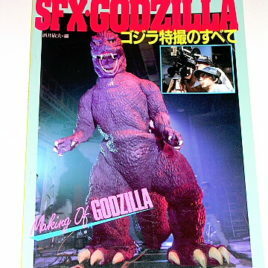 This "SFX the MAKING OF GODZILLA 1984" is a fascinating soft cover book. It has 56 pages of incredible photos of all aspects of the making of Godzilla 1984 including never before seen detailed photos of set making, suit design and the making of the Godzilla cyborg, behind the scenes shooting of the movie and concept art. Also, there are about 10 pages devoted to behind the scenes photos from the earlier Godzilla movies 1954-1975 including a full page photo of NICK ADAMS with his wife (we think) and Godzilla.There are also some unusual artist concepts for the monsters Gabera, Gigan and King Seesar. This is truly a FASCINATING book for special effects fans. Book dimensions 8 1/2 inches by 12 inches. PLEASE scroll down for more photos. GODZILLA 2000! 82 pages of Excitement. Excellent full color shots from G 2000 including the making of and sfx, photos of model making for the sets, artist sketches, interviews with cast and crew and photos of Bandai toys produced for the movie. Book dimensions 8 by 12 inches.